Working boats on the beach, not yachts lining harbors, greeted us. Monaco's glamour spills into the 3 French towns that seamlessly engulf it, but Monaco's glitz and luster never penetrated the border of Italy only a few miles away. The Italian coastline looked like a poor cousin to the French Riviera and Monaco. On the French/Monégasque side of the border, life looked like that of Cinderella's in her glass carriage; on the Italian side life seemed like Cinderella's when she suddenly found herself sitting in a pumpkin. 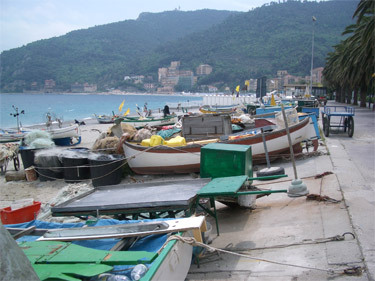 The Italian version of French Riviera and Monaco harbors were modest breakwaters with row boats on the beach and small craft in the water instead of moorages for yachts costing hundreds of millions of dollars. The villa's clinging to the steep hillsides were small and in need of repair rather than grand estates with lush gardens carpeting the slopes. And the bustling crowds on the streets were more like us--just ordinary folks. But across the border into Italy the weather was still delightfully warm and the Mediterranean was still enchanting with its varying shades of blue. It wasn't long and we began recovering from our fantasy world experience on the Riviera and turned our attention to enjoying the sweetness of less glamorous Italy. We have crisscrossed Italy a half dozen times and have always savored the experience. We enjoy the people the most in northern Italy, which is where we'll be. "Up north" they retain the spontaneity and ease of their southern kin but with more of the "can do" attitude of their northern neighbors that we value. I was pessimistic about getting a place for the bikes in the the first small hotel I considered as it was on the 5th and 6th floors of a building and usually the bikes are most welcome where there are spare nooks and crannies on the ground floor or in a basement. But for this Italian host, the bikes were no problem. He selected a larger room that happened to have a terrific sea view out large windows so the bikes could lodge with us. (And fortunately Bill has mastered the art of standing our bikes on end in tiny elevators.) Ah, that "can do" spirit greeted us on the first afternoon. The willingness to make it work came up on my first grocery store visit too. The clerk was apparently asking me if I had a 5 Euro bill to assist her in making change, but when I was unresponsive, she asked me again in German. Fortunately for both of us at least a few of my German numbers were still circulating even though we hadn't visited a German speaking country in the last year. The outgoing and friendly demeanor of the Italians put pressure on our fledging language studies. The night before we entered Italy I had dusted off our phrase book and reviewed the most basic words needed for navigating the roads and sidewalks, things like: "left, right, go straight ahead, the traffic light, the corner, where is, please, thank you and excuse me." We hadn't prepared our script for renting a room but the hotel clerk's English was sufficient for me to set my phrase book aside for the moment. That night I wrote the phonetic version of the room renting script and thought we'd be set for a day or 2. We had talked about a strategy for working on our Italian but weren't in any hurry, but that all changed the next day. We love the poppy fields in Italy. Before we'd finished loading the bikes the next morning an older woman was enthusiastically commenting on our adventure without even knowing where we were headed. Minutes later a man engaged me as I stood with the bikes while Bill went in search of road maps. As soon as the man left, I scrambled to find and write down 'chit-chat' lines in Italian for the next person who wanted to talk with us, including: how many kilometers we had already ridden, the weight of our bikes and luggage, our nationality, and how many gears the bikes have. I've learned that having answers is more important than understanding the questions--most who stop to chat are satisfied with collecting some information about us even if it isn't what they asked. And sure enough, it wasn't even noon and our third conversation was off and running with some of my newly rehearsed phrases getting a work out. That flood of attention from passersby was the perfect motivator for us and we spent much of the the afternoon's ride towards Genoa learning our numbers in Italian. We discovered in Spain that we could get a good though imperfect grip on a Romance language's numbers in a day if we stopped to study the phrase book a few minutes at a time and drilled ourselves off of the numbers on passing car license plates. We start with 0-10, then add in about 10 numbers at a time and drill ourselves on single digits, then pairs and triples and amazingly in a couple of hours we are doing quite well. And like in Spain, the effectiveness of afternoon's numbers study was validated when I could understand the quote for a hotel room that night. The friendliness of the people certainly spurred us to hone our Italian language skills and almost anything we were prompted to learn came up in exchanges. One day I decided it was time to learn the words for the most common colors and suddenly we were hearing "green key" and "white door" from our evening hosts. After a soaking downpour, Bill asked a fluent English speaker at Alba for the phrase "Is there a room where we can dry our clothes" as in the past we learned that B&B's in mountainous regions traditionally will share their boiler room as a drying room for their hiking guests. The downside of the exuberant Italian culture is their wild children. The last time we were in Italy we lost too much of a night's sleep because a school group ran wild in the halls until the wee hours with the hotel management shrugging it off. We weren't in Italy a week and as our evening was winding down a school group returned for dinner at our seemingly empty hotel. This time we pressed for a room change at 10 pm instead of getting put off until midnight as before, but it still took a toll on us. In the morning I assembled a new set of words for hotel shopping "We like a quiet room. Is there a group of children here tonight?" Hard to miss the Genoa cathedral. I was on a mission in visiting Genoa, which was to learn about its role in Italian history. Genoa kept coming up incidentally over the last several years in antagonistic roles, like with Venice in its heyday, but we had yet to learn about Genoa head-on. Genoa is long on art history sites for tourists to visit but the story of how it came to its glory days is kept in the recently relocated maritime museum. To spare ourselves the biking headaches and high prices of staying in the city, we laid over 25 miles away and took the train in for the day. As we walked to the museum from the train station we began to understand what was unique about Genoa: grand palaces and their associated churches built by the competing ruling families were scattered around town. The Romans and Byzantines brought maritime knowledge with them to Genoa and later, under the Longobards, a primitive class of shipbuilders evolved that engaged in both trade and piracy. By the 11th century Genoa had evolved into a significant maritime power. Powerful dynasties developed in this city of entrepreneurs and the lavish structures were a part of staking out turf with deadly seriousness in the port city. Like Venice, Genoa was a big player in the Mediterranean sea trade, though the museum sidestepped that bit of vicious rivalry. Though Genoa was Christopher Columbus's birthplace, the wheelers and dealers didn't see fit to finance his historic voyage to the America's and the riches of that discovery instead went to his backer, Spain. The bounties from pillaging the New World shifted the focus from the Mediterranean to the west, causing a serious decline in Mediterranean trade. Rather than languishing in this changing reality like others did, Genoa rewrote its business plan and dropped direct trading in favor of making extremely high interest loans and renting ships to Spain. Like many newly rich, Spain's tastes outstripped the huge wealth it imported from the America's and it was constantly teetering on bankruptcy. 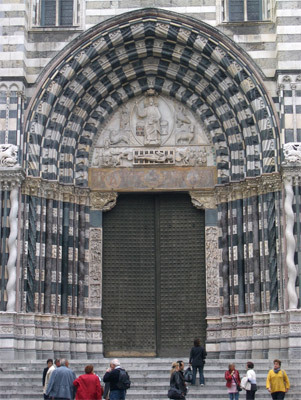 The Genoese used part of their riches from interest payments and renting out ships and crews to the Spanish to build and elaborately decorate family palaces and churches. We stopped in at church after church and ogled the flamboyantly decorated edifices designed for family-sized congregations. Familiar names like Rubens and Van Dyck were among the imported talent painting frescoes for the nobility. But Genoa's alliance with Spain ultimately was their undoing as the rival French destroyed Genoa's harbor in 1684, from which it never really recovered. The Maritime Alps emerging out of the clouds. Our generally eastward journey turned north: we said our goodbyes to the Mediterranean for the next several months and headed towards the mountains. The great weather we'd had for weeks soon soured and everywhere we'd been the last 2 months was clobbered by a drenching storm. We had detoured into the vineyard covered hills southeast of the small city of Alba on the recommendation of the Michelin Green Guide and enjoyed the lush hillside vistas despite the low clouds and rain. Yes, it would have been lovely in the sun with a blue backdrop but even a wet panorama is better than none. The always intense Italian urban traffic forced us back into the hills as we left Alba the next morning. The innocent-seeming detour to escape the truck route to Turin immediately threw us up against steep grades, with the only posted one being 18%. We'd considered the nonexistent traffic and quaint villages sufficient payback for the effort but then we were unexpectedly treated to a 180 degree sweep of the Maritime Alps freshly dusted with snow from the previous night's storm. The parting clouds just barely revealed the splendor of the mountains. The spectacle could hardly have been better with bright red poppies blooming on the edge of the roadbed, vineyards and pastures wrapping around distant homesteads, and an almost endless parade of jagged snowcapped peaks off in the distance. We stopped repeatedly to admire the changing views as our ridge top road curved northeast. 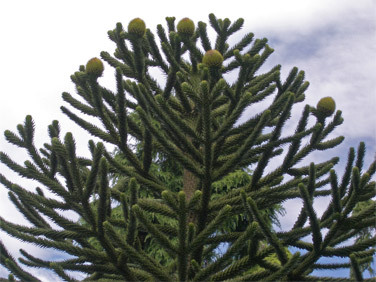 Our first sighting of cones on a Monkey Puzzle tree. Fortunately the ride out of Alba was scheduled as a short day as our route into the hills turned out to be a very circuitous one and after riding 17 miles we'd only gotten 10 miles away from Alba. Map Man was a bit red-faced but we'd loved the excursion. The mountain views had been outstanding and the decorative under-the-eve painting and woodwork that we associate with northern Italy had reappeared to our delight. We savored the artistry of the buildings and the landscapes and lingered to admire the outrageous textures of young cones on an assortment of conifers, many not native to the region like Sitka spruce and Monkey Puzzle tree. 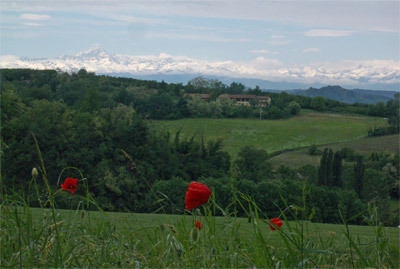 Ah, it was coming back to us, why it is that we always enjoy northern Italy and the Alps region. The sometimes too shabby look of more southern Italy drifts away as one travels north and the land and the communities look increasingly well groomed and robust. Everything around us was green and lush, whether it was the planted crops, the specimen trees in the yards, the vineyards or the poppies. Homesteads were tidier looking, the roadside litter level dropped down, and the scenery kept on delivering grand views. The people in Italy add to the pleasure of being in their country too. Italians are approachable and eager to help. Bill flagged a passing car at the base of the posted 18% grade hill as the signage was unconvincing as to which road we should take. The occupants assured him that indeed our road was the one with the steep hill and the car took off. But after driving 50' up the hill, they put it in reverse (Italians drive in reverse more than many of us do) came back down the hill and offered to load us and our bikes into their station wagon. We declined the kind offer as it would take far less time to ride the short hill than load everything into a car. 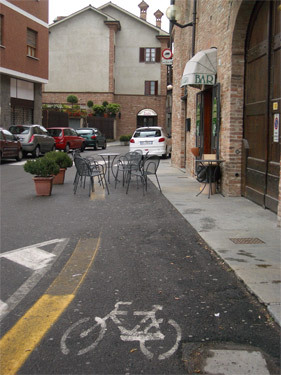 A 'multi-use' bike lane in Alba. Italians are serious cycling fans and in northeastern Italy we were well received even as the rare cyclotourist. We've heard "Ciao" from many a passing Italian cyclist and received waves from many others. One older guy riding his 'beater bike' into town on the bread run told us (in Italian) about his 15 lb titanium bike as the 3 of us waited at a train crossing. Later, an English speaking Italian rider spoke of his 2 Cannondale bikes and the overnighter's he and his wife do on their mountain bikes. And more than one passerby stopped to inspect our bike and nodded approvingly. We had watched spring practically unfold a leaf at a time as we rode through France but it Italy is was a done-deal. The once intensely-pink blossomed Judas trees were now just another green tree; the planted grasses and onions were up and maturing, the vineyards were fluffy looking with their new leaves, and everywhere we looked there was the bright look of spring green turning to darker shades. The Black Locust trees were loaded with blossoms and about the only tree in full bloom. We peered at a few conifers to find their tiny new cones and cone-like blooms and discovered that Indian Bean trees are harder to spot before their young leaves reach their dinner-plate size. We spent 2 divine days meandering around the hills while slowly making our way to Torino (Turin). The stunning and repeating views of the low eroded hills that mimicked the saw-toothed roughness of the distant snow covered peaks captivated us. The marvelous distant mountains served as exciting guiding beacons for the coming weeks journey and became more postcard-like with the return of blue skies. 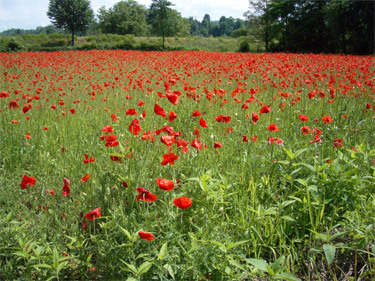 And the always bold red poppies mixed in with almost blue-tinged cereal crops loaded with plump grains added zest to the agricultural landscapes. But we knew that getting into Torino, Italy's second largest industrial city, would be no meander. Map Man's search for a tiny road into town came up empty and we'd have to shift from savoring grand panoramas on small back roads to staying alive in fast traffic on a truck route. But the push into the city went better than almost all other city approaches as the wide road shoulders held for part of the sprint and the truckers were their usual accommodating selves when it comes to cyclists. We spotted a bike lane on the outskirts of Torino and a local cyclist nodded when Bill asked if it went to the center of town. Among the man's many words we didn't understand, we did catch something about a park or river and we soon discovered we were in for a rare treat. The meandering spirit we'd enjoyed in the hills would continue for miles in a developed green way along the Po River. Instead of mixing it up in chaotic urban traffic, we found our way to the heart of the city by puttering along the multi-use path with roller skaters, walkers, and fishermen. For miles we rode in the delightful atmosphere of people out enjoying the warm, sunny afternoon along the river. And if it wasn't dreamy enough, this park had a few of its grand trees labeled, allowing us to finally identify the Himalayan Pines we'd been seeing but hadn't recognized in our field guides. Fortunately not all of the trees were labeled or we wouldn't have made it in before dark. Getting into Torino reminded us of prior experiences in northern Italy: there are long bike routes around, the trick is finding them. Ancient Egyptian sandals that look almost new. Torino's history includes being the capital of a Celtic tribe, a Roman military colony, the first capital of the unified Kingdom of Italy in 1861, and the capital of the Italian motor industry with the founding of Fiat in 1899 but it's most important museum features the Egyptians. That unexpected focus started in the early 1800's when an Italian king bought the ancient Egyptian collection of one of Napoleon's French buddies stationed in Egypt and was substantially added to by a couple of dig-crazed Italian archeologist's in the early 1900's. The result is that both of our guide books acknowledge Torino's Museo Egizio as among the best in the world for Egyptian antiquities, with Lonely Planet ranking it after Cairo and and London. We can't comment on Cairo, but Torino's displayed collection is certainly larger than London's though who knows how the basement collections compare. I must say that London's Egyptian displays are more attractive, but if you want a deep immersion in old Egyptian finds, Torino won't disappoint you. They have the requisite couple dozen mummies in all states of display from desiccated flesh through to the multiple layers of linen wrappings and the elaborate sarcophagi. And Torino's displays include hundreds of feet of beautiful papyrus scrolls you can get your nose right up to plus beautifully carved statues, stele, urns and amulets. But what Torino has that we have seen little of before are the less stately goods, like the piles of 3000 year old bread, fruit and other foods. 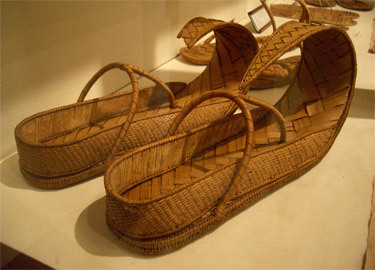 There are numerous vegetable fiber sandals in beautiful condition; linen yardage and garments; beds and stools; leather sandals; and accessories. Theirs is an eye-popping selection of normally perishable household items in fibers, leather and wood in addition to the more usual collections in stone and metal. And the curators have tossed in several models and full scale displays of homes and tombs to literally put it all in perspective. We chose not to rent the audio guides but can imagine that they would be a good supplement to the intermittent English descriptions. On our way to the Egyptian museum we were surprised to discover that Torino was getting added to our list of sights we accidentally visited before the big event. We were in Cannes 10 days before the film festival, in Monaco about 10 days before the Grand Prix and we are in Torino as it was gearing up for the February 2006 Winter Olympics. We detoured into the promo kiosk with models of the arenas being built in Torino and surrounding ski areas for the event, saw memorabilia from the Swiss-based Olympic museum, and admired the logo-gear ready to go out the door. Out on the streets we navigated around the torn-up roadways and sidewalks and listened to the rush hour traffic accented with blaring horns in the construction zones as the city spiffs for the onslaught of visitors. Once again, I am happy enough to see the build-up and don't really want to be in the confusion of the Olympics itself. The route from Torino to Milano was very flat but the long line of the Swiss Alps off our left shoulders reminded us that it wouldn't be flat for long. Glimpses of snow-capped Monte Rosa, the second highest peak in Europe (over 15,000'), added to the excitement of the seeing the Alps. Our attention would shift from the sight of the many flooded rice fields that proved irresistible for the ducks and egrets and a few heron, to the sounds of many frogs and back to the distant mountains. The region was lush and alive with poppies; bulging grains; corn fields that ranged from stalks just poking up to some that were 2' high; poplar plantations; and meandering irrigation channels to nourish them all. At times the exuberance of spring was literally in our faces as the airborne fluffy hairs surrounding the poplar seeds tickled our noses as we rode and at one picnic lunch the ground looked like it was covered with snow but instead it was a thick carpet of fallen Black Locust pedals. Occasional rain storms were a nuisance to us but cleared the notorious Po Valley pollution giving us better views of the Alps than when have approached them from the eastern side of Italy. But a couple days after the rains subsided, the views of the mountains disappeared behind the yellow-brown curtain of haze. Hanging out on their bikes in a village near Milano. This flat land supported a thriving bike culture in the villages. People of every age were out and about on bikes. Bikes almost looked like appendages for the older men and women who cruised into town to shop. They often stopped to visit with each other, either astride or leaning on their bikes. 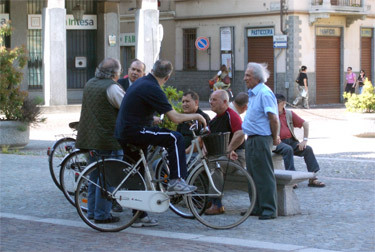 In one plaza a half dozen men partially sat and stood over their bikes in the shade, just perusing the scene. Other groups of conversing men sat and stood with their bikes nearby. Women were standing in doorways visiting with women who had been passing by on their bikes and dismounted. Almost all the bicycles were single speed, whether flashy and new or an ancient steed. Mothers and grandmothers had seats over the back wheel on which to transport 6 or 8 year old children back home from school at lunch time or at the end of the day. Younger children rode on smaller seats mounted on the handlebars. In these pancake flat towns in the Po Valley it seemed that everyone had a bike and that people rode them until they couldn't walk. Even the fine tuning of the water flow into the rice fields was often made by a man with a shovel and a hoe strapped to his bike frame. 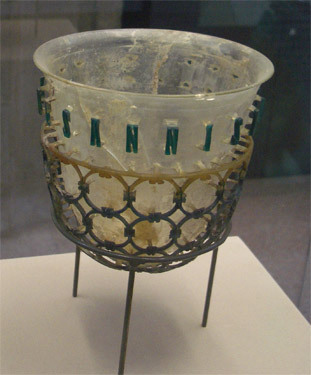 This Roman cup is cut from a single piece of glass. We made short work of Milan, taking a train from our hotel in the 'burbs into the fashion capital of Europe for a full day of sightseeing. Our guide book recommended calling ahead 3 or 4 days for a reserved slot to see da Vinci's Last Supper but even in low season in May it was instead a 3 week lead time for tickets so it is on our "Next Time" list. (Within Italy phone for reservations: 02 894 21 146). We ogled the exterior of Milan's brilliant marble Gothic cathedral with its 3200 statues and 135 spires. In contrast, the interior was quite dark with only the stained glass windows to perk it up. We enjoyed walking under the nearby glass and steel roof of the open air Galleria Vittorio Emanuele II with its intriguing inlaid stone floor and arcade of shops. Known as 'Milan's drawing room,' it looked like a wonderful place to linger on a warm day. Then it was on to the archeology museum where we were treated to a elaborate 4th century ce Roman cup cut from a single piece of glass. We were a bit disappointed in the Leonardo da Vinci section at the science and technology museum, but cruised around looking at their other extensive displays, ranging from making nails to wooden bicycles. Map Man left Milan with 2 new guide books for route planning and as expected, high-fashion Milan wasn't the place for me to buy the SeamGrip I needed to further waterproof my rain jacket's pit-zips. Internet connections for our laptop are scarce in Serbia but we finally found a connection point. That combined with the rare treat of a reasonably priced hotel room with air conditioning to give us some relief from the 90-100 degree heat, humidity and mosquitoes convinced us to lay over a couple of extra days to get caught up on our emails and journals.